Dolls made by Colyne of TRMs Trimaris, for Ealdormere's royal gift basket, Gulf Wars 2014. Colyne is an apprentice to Duchess Adrielle Kerrec (OP, OL). Most of his endeavours in the arts and sciences concern the written word (chronicling, history and bardic works), though he is also interested in bookbinding, period games, armouring, sewing dolls out of felt, basic leatherworking and cartography. Colyne's first attempt at glass beads. 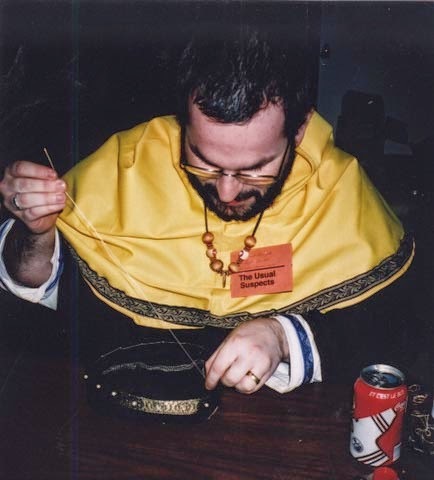 Colyne beading a hat at Quest for the Golden Seamstress II, in the Kingdom of the Middle, 2003. Photo by THL Thorfinna gra'feldr.